Today we join hands and paws with friends around the globe in peace. "My therapost told me the way to achieve true iner peace is to finish what I start. So far today, I've finished 2 bags of M&M's and a chocolate cake. I feel better already." "I'll have a peace of that." We're blogging for Peace today too. Dona Nobis Pacem! I'm hoping for no smacky paws today! Well, Waffles should give peas a chance. 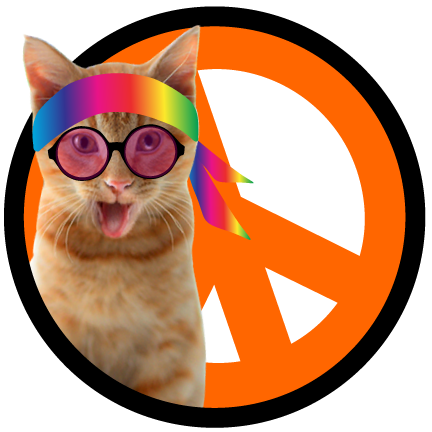 Peace, love & purrs! And extra smooches for Waffles. The Happy Goats are SMILING for Peace today. They have tried a bunch of other things that have not worked so now they are trying this. They are stubborn; they will not give up. Peace out Waffles & Katie! Beautiful "Peace" badges Katie and Waffles.....Waffles you look very retro in that headband dude. Beautiful image. We blogged for peace today too. We purring for peace and wishing you a very peaceful day. love it! I am laughing at Waffles because I was seriously going to deck Cody out in tie dye today and then changed my mind, now I wish I had! May it be so… om shanti, shalom, salaam, peace, peace, peace. MOL Waffles you should have been around in the 60s you are such a flower kitten. Love the post we are blogging for peace today too. Mommy is suddenly in the mood to eat a whole bag of m&ms. Love the quote about chocolate cake!! One of the most creative peace globes I've seen today. Peace to you and yours. How happy I am to have lived this long...but I do wonder where all the cats were in the 60's! That's a beautiful peace globe but I'd expect nothing less out of the best designer on the Blogosphere. Peace out! Glorious globe for a glorious day! We is purraying that ALL days is peaceful! We love your unique style of purrin for peace. Also we used the Jimi Hendrix quote and didn't know it's attribution, thank you! And W2 I hope you get a piece (of tuna or ham or a side of beef)!! 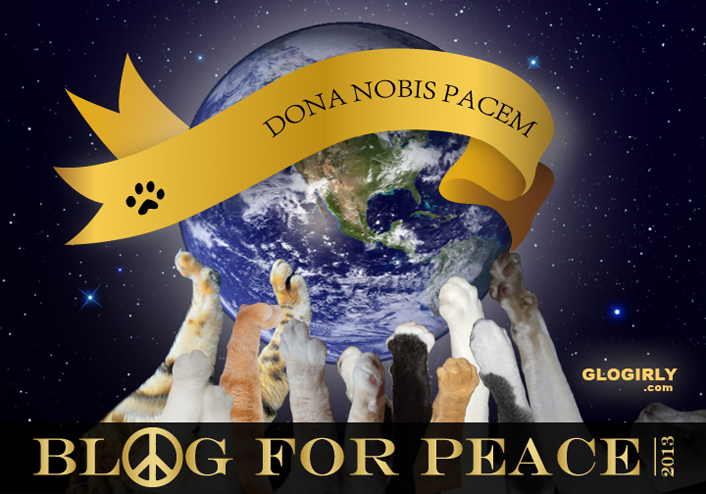 We are peace blogging cats too! What a great post, and peace globe! We, too, are wishing, purring and praying for peace for all beings. Today and every day. Lovely graphic and good post. Good job, Waffles and Katie. Any chance of peace breaking out between you and the gingery one? We hope for a world of peace, for paws and for people. As for Waffles, I think a little spelling lesson may be in order. Lulu says: Waffles, I think you are very cool with your headband. Love, purrs and everlasting peace from the Squeedunk gang. That is so wonderful! I hope you all have a peaceful day! A lovely globe. I am purring for Peace throughout the world. What a cool peace globe! Wishing everyone peace today. What a beautiful day when we can all come together in Peace. Namaste. We wish for peace too. Really nice globe. Peace to you and yours on this and every day. Waffles looks awesome and I love his quote! And the globe looks really great too. Great post. Your peace Globe is spectactular!